From the 23 to the 25 November the meeting will be held in the "Universidad Industrial de Santander" (UIS) in Bucaramanga. The campus of UIS is located at Carrera 27, calle 9, Bucaramanga-Colombia. The special event on 26 November will be held in the Auditorium of "Planetario de Bogotá", located at Calle 26 #5-93, Bogotá-Colombia. On 27 November the meeting will be hosted by "Universidad Nacional de Colombia" (UNAL), whose campus is located at Carrera 45, calle 26, Bogotá-Colombia. In the morning, the event will take place at the Auditorium of "Edificio de Ciencia y Tecnología" while in the afternoon it will take place at the Paraninfo of the "Edificio Insignia Julio Garavito Armero". For details of the location in UIS, please click here and then click Bucaramanga --> Campus Principal. 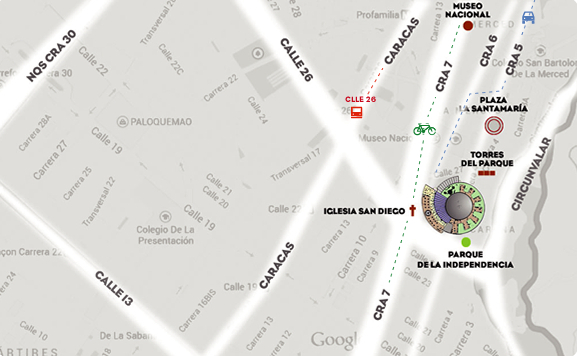 For details of the location of Planetario, please see to the following map.